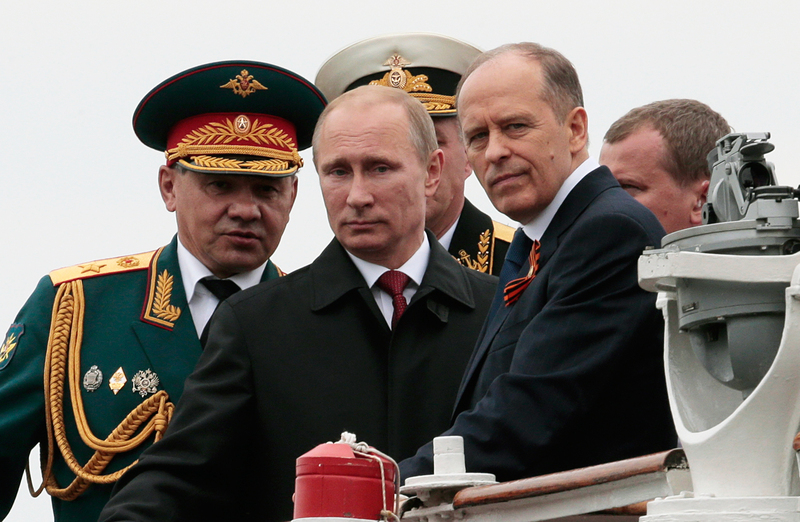 Russian President Vladimir Putin flanked by Defense Minister Sergei Shoigu, left, and Federal Security Service Chief Alexander Bortnikov on May 9, 2014. Russian President Vladimir Putin is experimenting and looking for new options for ideological support and staff recruitment as the influence of his closest entourage begins to wane. Analysts believe this may imply a reset or even a dismantling of the existing governing system. Russian President Vladimir Putin is in the course of forging a new inner circle of advisors and supporters in order to consolidate the political system he has created, the authors of a new report released by the Minchenko Consulting communications holding have concluded. Based on the postulate that by 2012 Russian President Vladimir Putin had formed a separate informal governing instrument that in many ways resembles the Soviet Politburo, the document, titled the Politburo 2.0 Report, is regularly updated to analyze the evolving configuration of forces in the highest echelons of the Russian government. The politburo members are essentially the senior managers of the Russian government, each of whom is responsible for his or her administration and sphere. Putin himself manages the “Politburo 2.0” as an arbiter, resolving all disputes and occasionally redistributing influence within it. Who is Putin's new chief of staff and what does the appointment mean? "The term ‘Politburo 2.0’ means an informal network structure of coordinating interests of the main elite clans in which Vladimir Putin is the arbiter and most influential figure," explains one of the report's authors, Kirill Petrov, adding that this "informal power organ" is the main mechanism for resolving organizational and sectoral contradictions. In the current report the authors not only speak about the changes in the member positions of “Politburo 2.0” but also ask whether it is possible for the president to dismantle the existing governing system or at least reset it. The report mentions the regrouping of forces in the highest and middle echelons of the Russian nomenklatura. The researchers note the dismissal of high-profile representatives of Putin's "old guard" (such as former director of the presidential administration Sergei Ivanov and former head of Russian Railways Vladimir Yakunin); "the activation of an anti-corruption agenda and its use in the inner elite struggle, including against anti-corruption departments; rotation and reforms in the law enforcement structures; and the renewal of parliamentary deputies in the State Duma. The report underlines that one of the reasons for the change is "Putin's unwillingness to become a hostage to his entourage." The president, according to the report's authors, is trying to form autonomously and on a competitive basis his election coalition and a future power configuration. And to do this it is necessary to weaken the “Politburo 2.0” itself. There has been a regrouping of forces among the elite. Most of the members of the “Politburo 2.0” have consequently been weakened, while Defense Minister Sergei Shoigu has become stronger during wartime and equal to the director of Russia's renewed National Guard Viktor Zolotov. The report's authors remark that Putin usually acts in accordance with the logic of "checks and balances. Putin is currently studying the various options for "ideological support and staff recruitment" for his next presidential term. The authors explain that the president is testing young technocrats (Head of the Presidential Administration Anton Vaino, Minister of Industry and Trade Dmitry Manturov), "princes" from elite families who position themselves as technocrats (Moscow Region Governor Andrei Vorobyov), people close to him (Tula Region Governor Alexei Dyumin, who for a long time worked in the presidential guard), as well as social and party activists. "Moreover, judging by the last staff decisions, as a reference point (but not necessarily an attainable one) Putin is using his first term in office, in which he carried out a serious of liberal economic reforms and normalized relations with the West," the report stresses. One of the predictions that the report's authors make is that with recent attempts to establish dialogue with the collective West having proved useless, the people who will have significant potential are those who have the possibilities to "effectively conduct communication with Europe and the U.S."
Among them are Head of the Center for Strategic Developments Alexei Kudrin and former head of the presidential administration Alexander Voloshin. Political analyst Alexei Makarkin notes that the system now is based not only on the principle of checks and balances: "I mean that Putin doesn’t need powerful clans. As soon as the objective is reached, the appointees go home. This is the system that currently suits him most," he said.